Plans for refurbishment of The Barn have been made with cost very much at the forefront of any decision making. We are also mindful that it is a council-owned building and our current lease is for 5 years. We have therefore looked at the ways that we can balance a good quality venue for the community, while keeping within a very tight budget. Decisions on plumbing, where to site the kitchen, using existing soil pipes for example are just some of the areas that have been considered to keep down costs. We have had some amazing offers of free help notably from architectural company Egg Design Group in Brighton who have guided us through the process and produced some great plans. However we need more voluntary help in order to do realise these plans. Please get in touch and make this plan a reality! The barn is poorly insulated. We plan to increase the roof insulation to comply with Building Regs. The plan includes taking out some of the existing walls in order open up the space which can be used for a real range of activities. We have had a structural survey carried out on the property and have been assured that the proposed work can be undertaken safely. The existing smaller space will be maintained but safety glass inserted into the partition. A wide doorway with lockable door will be fitted between the two areas. In consultation with past users we understand that the existence of the smaller space has been very useful as a welcome area, information area, eating area at parties, cloakroom etc. People arriving late for classes and events won't disturb the ongoing activity in the main room. Heat loss can be minimised in the main area when people are entering through the door. The space can be used for activities which don't necessitate use of the whole barn eg smaller meetings, changing area and refreshments for sports/outdoor groups. There will be no need to heat the whole barn which is costly in the winter months. When used as an eating area (e.g. children's parties) its proximity to the kitchen allows for easy access and also a place where things can be prepared (e.g. table laid out) separate from the activity in the main area. With only one space the room becomes very long and narrow with problematic sight lines and issues with sound. With two exits the two spaces could be used simultaneously for different groups. For meetings it could be useful as a breakout area for a smaller group of people. The ceiling is damaged, due in part to a previous leaking roof added to damage from building work. We would like to replace it. With a better ceiling a new lighting system will be easier to install which we hope will include dimmable lights, useful for events which are more suitable to lower level lighting. New plug outlets, wall hung heaters and lighting system are planned. The Barn is not linked to a gas supply and the cost of installing gas is prohibitively high in the circumstances. It is planned to incorporate wall mounted electric heaters which have become much more efficient in recent years. The Barn floor currently has varying levels which will need to be smoothed out before new flooring is laid. Due to the wide variety of activities which will take place in the barn along with the position on the green it is planned to lay lino across all the areas. The kitchen area although small is larger than the previous area and uses existing plumbing. We plan to open an existing window which will bring light into the kitchen and area outside. A worktop, sink and kitchen cabinets will be installed. utilising the existing plumbing. 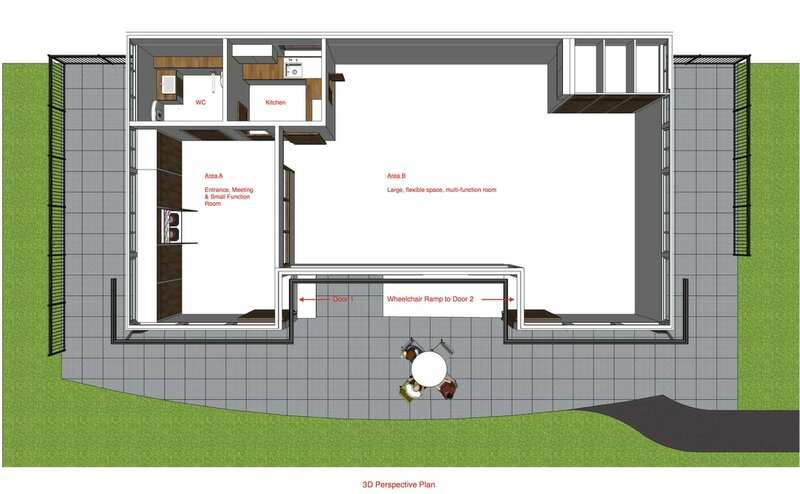 Plans include building a hatch between the kitchen and main area. We are planning to have a fully wheelchair accessible toilet. This will involve widening the door and including all the fittings for this purpose plus an alarm and extractor fan. A wall mounted baby change would also be installed. Storage is an important factor, especially for groups using the Green as well as The Barn. We have planned for two storage areas. Whether cupboards can be built and what they look like depends on help offered and funding – it might be shelving only, although some lockable cupboards would be very useful for groups using the barn. The other storage area for chairs and tables is located in the corner of the main area covering a structural step which cannot be removed. Building of a ramp on one of the exits allowing the elderly and those in wheelchairs easier access. Building of a drain alongside the patio edge to improve the drainage situation. The digging of a new soak away will also be necessary. Increasing the size of the patio by one or two patio tiles to allow more activities to occur throughout the year on the hardstand. Improve the path's condition which is currently dangerous. Drop the kerb at the end of the path for both wheelchair access and bringing equipment into the barn.